Ancestry now has enhanced census records. 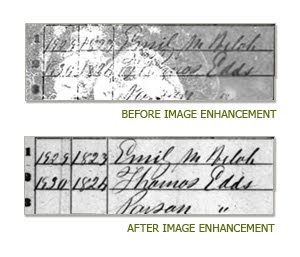 In a blog post on their main website, Ancestry announced that they went through over 200 million records and enhanced records, removing tape residue from the images and adding clarity. As you can see from their example, this is amazing and has put something on my to-do list: go back over old census records and see if I can read the names now!